Chef’d is the only subscription-free meal marketplace allowing you to discover new foods the way you want—no strings attached. We have over 700 recipes from some of the best names in food—celebrity chefs, major brands, and culinary influencers. Founded in 2014, Chef'd is Headquartered in El Segundo, CA with production facilities in El Segundo CA, Brooklyn NY, & Pico Rivera, CA. Chef'd is a venture-backed, high growth company with strategic funding. We're at the beginning of what promises to be a massive wave of e-commerce growth & innovation! 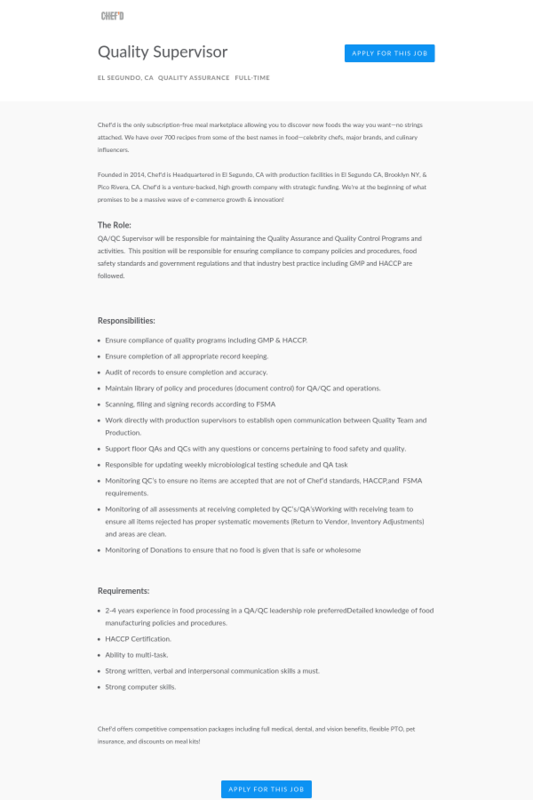 QA/QC Supervisor will be responsible for maintaining the Quality Assurance and Quality Control Programs and activities. This position will be responsible for ensuring compliance to company policies and procedures, food safety standards and government regulations and that industry best practice including GMP and HACCP are followed. 2-4 years experience in food processing in a QA/QC leadership role preferredDetailed knowledge of food manufacturing policies and procedures. HACCP Certification. Ability to multi-task. Strong written, verbal and interpersonal communication skills a must. Strong computer skills. Chef'd offers competitive compensation packages including full medical, dental, and vision benefits, flexible PTO, pet insurance, and discounts on meal kits! Confirmed 14 days ago. Posted 30+ days ago.